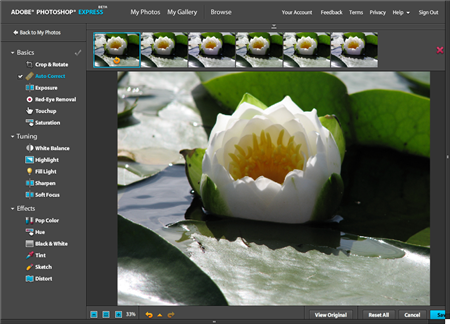 Adobe officially joined the world of online photo editing with Adobe Photoshop Express. This online service allows you to upload photos, edit them, store photos in online albums, and selectively share some or all your photos online. This means you now have access to many of the basic Photoshop editing features without needing to own Photoshop and without needing to have your computer with you. In addition to having a photo repository with Adobe's Photoshop.com site, you can also pull in photos from Facebook, Photobucket, and Picasa, which might get me to try uploading some photos to one of those services, instead of my personal preference Flickr. I wasn't entirely sure I'd like editing Photos in a browser, but even testing the service from my AT&T BroadbandConnect account worked easily enough to convince me this could be a great way to edit photos going forward. Most of the editing features offer you multiple choices, so you can test several variations live, which makes editing just as fast as using desktop software. Editing is non-destructive, so you can always go back to the original version of the file, with a version history that allows you to look back through many undo iterations. Of course if you need automated actions, you'll still want to have Photoshop CS and many of the advanced features of Photoshop Elements aren't found here. For free Adobe has done a great job of exposing popular features, making editing easy, and paid attention to the need to store photos outside of the Adobe universe. Give Photoshop Express a try and you may think twice about tying up system resources with additional photo sorting and editing apps on your desktop. While I'd like to see support for more online services (especially Flickr), in the meantime Photoshop Express will be one of my keyword bookmarks, so I have it when I need it.